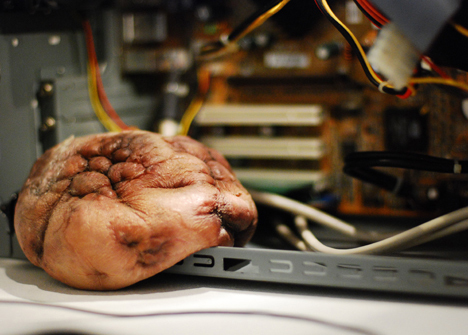 Interactive media artist Mio I-zawa’s “mechanical tumor” is a quivering hunk of fleshy, organic-looking material that expands and contracts depending on the amount of stress your computer is experiencing. Equipped with a series of motors and pneumatic actuators, the mechanical tumor pulsates gently when the CPU load is low. When the CPU load is high, the tumor’s air compressor is activated, causing the lump of flesh to inflate. The size of the tumor fluctuates according to the CPU utilization rate, giving the user a very tangible reading of the computer’s stress level.